We are proud to announce the availability of the Smartphone Brain Scanner as open source under the MIT License. 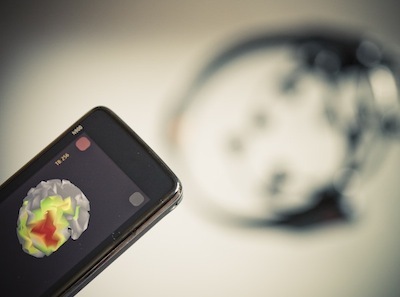 SmartphoneBrainScanner is a framework for building cross-platform real-time EEG applications. Originally developed at Technical University of Denmark for collecting and analyzing signals from Emotiv EPOC headset, its extensible architecture allows working with various EEG systems and multiple platforms. SmartphoneBrainScanner contains state-of-the-art techniques for working with multi-channel EEG signal in real-time, most notably source reconstruction methods with online adaptation to the noise level. Current implemented source reconstruction approaches cover the minimum-norm and low resolution tomography (LORETA) methods formulated in a Bayesian framework using a expectation-maximization scheme for hyperparameter estimation. The SBS2 source reconstruction is realized using a pre-build forward model connecting the cortical surface with the electrodes at the scalp. The current forward model provided with the software is a 3-spheres model obtained from the Matlab toolbox SPM8 using coarse spatial resolution and with sensor positions in accordance with the Emotiv EPOC system. Source code and additional information is available on the smartphonebrainscanner project website. This entry was posted in blog and tagged EEG, mobile by Jakob Eg Larsen. Bookmark the permalink.